Description : SnapGalaxy is an online digital photo printing and media social networking service. It lets users send photos to any destination in the world. 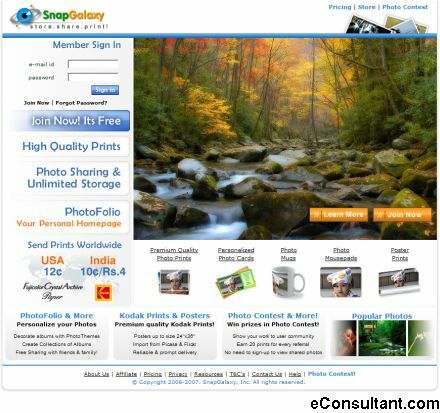 Besides, providing premium quality prints SnapGalaxy offers loads of features such as : 1. Unlimited Photo Space. 2. PhotoFolio – show your talent personalizing your photos – e.g. 3. VirtualPhoto – Link your photos to blogs, forums and websites. 4. PhotoThemes – choose an appropriate theme for photos. 5. Free Photo Sharing with friends and family – share it, tag it, comment it and have fun. 6. Photo Greeting Cards. 7. Referral Bonus.